It has been a very common misconception that people assume Canadian permanent residency and citizenship to the same. Well, both of the terms are related and have a thin line difference between each other. To help you understand the differences between of these Canadian status, here is a detailed comparison. Any individual who wishes to live and work in Canada must apply for a work permit. This permit allows them with limited travel rights and stay rights. But, what if one wants to stay abroad forever? Enjoy rights and benefits of the international country? In such a case, he or she is given an option of Canadian Permanent Residency. As the term shows, the candidate will get permanent residency status and enjoy a long term stay rights in Canada. He can move about freely anywhere in the country, bring along his family, work for any company, switch between jobs, let spouse work and enjoy several government benefits. This all would not be possible on a work permit. In a nutshell, a Canada PR will help one to settle in Canada on long term. By applying for a PR visa instead of a work permit, the interested applicant can enjoy an un-restricted life in Canada along with his family till the PR expiry (which is generally 5 years ). In fact, Canada PR is the first step to obtain citizenship. Without becoming a permanent resident of Canada, it is nearly impossible to gain citizenship of Canada. As a permanent resident, you will not be allowed to run/operate your own business in Canada. Also, you will not be allowed to vote during any elections. Who can get Canadian permanent residency? Citizenship of Canada is a status granted to humans born in Canada or permanent residents on the application. Through this status, the eligible candidates get all rights of citizens. This means that you as a citizen will be benefited with more rights than a permanent resident. Citizenship can be claimed by candidates who are either naturalized citizens or permanent residents of Canada. Such candidates need to pass a Citizenship test before obtaining this status. The major advantage of gaining a citizenship is it is not to be maintained like permanent residency. Often permanent residency has to be extended or maintained in order to have the status. Citizenship does not require any kind of efforts to maintain it. 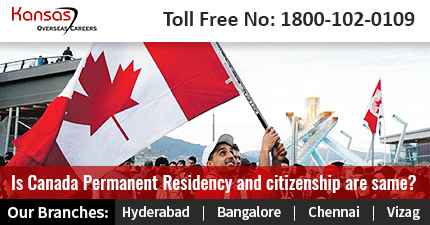 To know about how you are obliged to maintain permanent residency in Canada or wish to know how you can become a PR then a citizen of Canada, consult our Canada immigration experts today or call 180001020109.